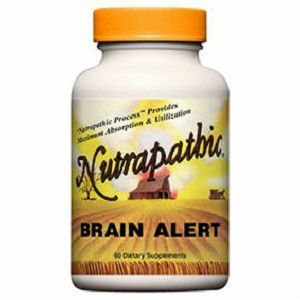 This is a review of Nutrapathic Brain Alert. The manufacturer claims that this product cleanses and nourishes your brain, spinal cord, brain stem, and nerves. Brain Alert also boosts alertness, clear thinking, balance, creativity, focus, coordination, and memory. Your will learn more about this product as you continue reading this article. We could not find any information on the manufacturer’s website about the recommended dosage. Dosage information is vital for potential users to know how to use the product. Therefore, the lack of this information may cause confusion, as consumers do not know the correct dosage. There is no information about the possible side effects, but users who are allergic or sensitive to any of the ingredients used to make this product should take caution. One bottle contains 60 dietary tablets and costs $13.50 on the manufacturer’s site. This is a relatively low price compared to the price of most products with similar functions. This price may cause potential users to question the quality of the product. We were unable to find any money-back guarantee from the product’s official website. A satisfaction guarantee is crucial because it assures potential consumers that the product is effective and that they can always have their money refunded if the product does not meet their expectations. Therefore, the absence of this guarantee may cause potential users to question the quality and effectiveness of the product. We were unable to identify any valid reviews from users who have used the product. Such reviews are important because they increase the confidence of potential consumers to purchase the product. Based on the list of ingredients used by the manufacturer, Brain Alert may perform the claimed functions. Most of the ingredients are known to have significant effects on the brain and body. This product is also affordable because of its low price. However, you should think about the drawbacks associated with the product before purchasing. A low price may signify low quality. The lack of a satisfaction guarantee and customer reviews also raise quality and performance issues. Additionally, there is no valid information about the appropriate dosage and the possible side effects. Moreover, the product is only available in the US and buyers to have to pay shipping costs if their order is below $35. Moreover, it may take a long time to receive the product. Henry Costa	reviewed Nutrapathic Brain Alert	on June 29th	 and gave it a rating of 2.5.